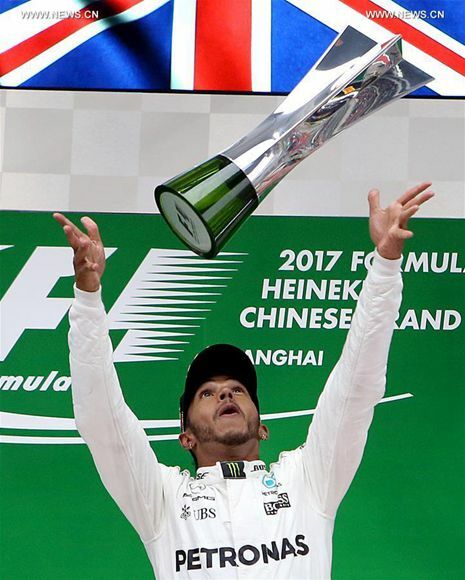 Mercedes' Lewis Hamilton grabbed his 5th China Grand Prix trophy with a dominating performance at the Shanghai Audi International Circuit on Sunday. It was also a third career grand slam for Hamilton, who secured pole position with an impressive lap time in qualifying yesterday. Hamilton lauded the work of his entire team in the post-race press conference. "It's been a fantastic weekend and I'm very very grateful for the team putting in the effort to get us where we are," Hamilton said. "I am just a chink in the chain, there are a thousand people involved," he added. He also predicted that this season's title fight could be a competitive one. "I think this will be one of the closest (fights), if not the closest, (that) I have experienced," Hamilton said. Hamilton also observed that the conditions favored Mercedes today given the colder weather conditions in Shanghai. He says he expects Ferrari to do better in the hotter conditions coming up in Bahrain. Speaking on the intercom to his pit crew just as the race concluded, Hamilton promised to keep the momentum going forward. "We will keep pushing, for sure," Hamilton said. It was also a great day for Red Bull's Max Verstappen, who clawed his way up to a podium position from 16th place on the starting grid. "It was a very good race, did not expect to finish here on the podium," said Verstappen, who was voted driver of the day by the spectators here in the grandstands. It was the eighth career podium finish for the youngster Verstappen, who has so far started in 42 grands prix. "It was a very challenging race but I really enjoyed it. I think I overtook nine cars in the opening lap so it was a very good race for me," Verstappen added. Verstappen's Red Bull teammate Daniel Ricciardo came in fourth, 46.035 seconds off the pace. Second-place finisher Sebastian Vettel, for his part, had high praise for the performance of his Mercedes competitor. "Lewis was quick. full stop," Vettel conceded. "I had a very exciting race...it was good fun," he added. Rounding out fifth place was Vettel's Ferrari teammate Kimi Raikkonen, at 48.076 seconds off the pace. The only accident of the race must have come as a deja vu for Sauber substitute Antonio Giovinazzi, who hit the wall again today after hydroplaning on the main straight. Lewis Hamilton mastered Shanghai's changing conditions and stayed clear of squabbling rivals to win the Formula One Chinese Grand Prix yesterday.